Childhood in Wyoming was full of hidden riches. 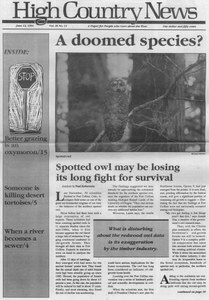 New monthly newspaper Dineh Tribune becomes fourth major paper for Navajo Nation. First annual Freedom Festival will celebrate energy independence. Federal audit shows $5.4 million intended for reforestation to have been misspent. Two-week course will explore Western issues. Teton Science School offers natural history courses. Voices of the Earth Conference set. Summer Fishtrap Gathering planned for Oregon. Adopt-a-Trail program thrives in Idaho's Targhee National Forest. Forest Trust publishes guide for environmentally aware logging and forest use. U.S. Forest Service's land trade with developer Tom Chapman signed, but Telluride neighbors ask injunction to prevent development. GAO reports say DOE has yet to investigate corrupt practices. People for the West, Colorado group, gather support from Western governors and others at conference urging resistance to "environmental storm troopers." Bureau of Reclamation builds a "Disneyland" Hoover Dam visitor center; cost will up power prices for area customers. Oregon environmental groups sue Malheur National Forest for violating Clean Water Act by allowing grazing to raise water temperatures in the Alan Day River, fatal to fish. Male grizzly bear trapped and moved after eating bird seed. Oil pits kill thousands of migrating birds. Agency destroys mining cabin used for recreation on Manti-Lasal National Forest. Harvester ants are stymieing nuclear waste disposal at INEL by digging tunnels and moving radioactive dirt. Who will lead the Navajo Nation? Six candidates for Navajo Nation presidency are running for the August primary. Increased tourism means no parking spaces at Grand Canyon. Babbitt plans to halt building of new roads, hotels and entertainment facilities in national parks. Fremont County schools cancel wolf presentations at elementary schools in Lander, Wyoming. Drought ahead for the Northwest in summer. Mescalero Apache tribe going ahead with controversial plan to store nuclear waste. Andy Kerr believes grazing must be ended rather than reformed. Rocky Mountain regional forester defends West Elks land swap.